On a day in which a horrific attack by the driver of a van in Toronto left 10 people dead and 15 others injured, hockey was likely the last things on many people’s minds. But it was also the day the Boston Bruins were in town to face off against the Leafs in Game 6 of the Stanley Cup playoffs. And far from staying home, hockey fans came out in droves amidst heightened security to the Air Canada Centre. 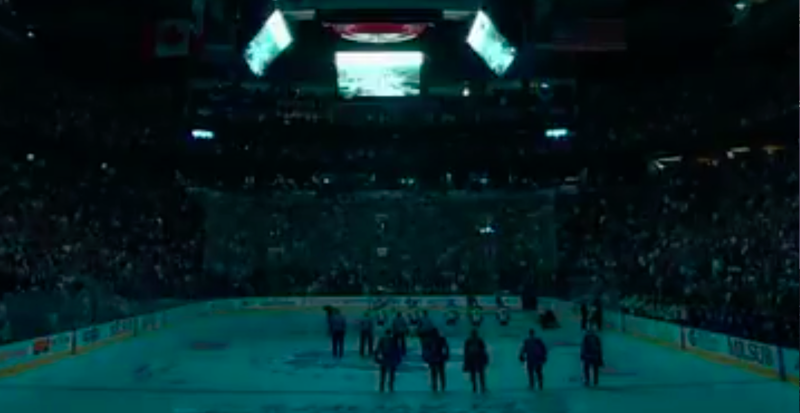 And it was here, during the game’s opening ceremonies, that the thousands of fans in attendance paid tribute to those who had lost their lives, the familes of the victims, and the first responders called to the scene, by going completely silent. The Toronto Police Operations Centre (OPS) announced a traffic advisory to the Rogers Centre and Air Canada Centre area following this afternoon’s events. York Street will be closed between Lake Shore Boulevard and Front Street. No Eastbound traffic will be permitted on Bremmer Boulevard from Simcoe Street. Pedestrian and car traffic is expected to be very heavy. The Toronto Maple Leafs and Maple Leafs Sports & Entertainment (MLSE) also issued the following statement following the tragedy. The Toronto Maple Leafs and MLSE are keeping all of those impacted by today’s tragic incident in Toronto in our thoughts and prayers. Our organization continuously works in close partnership with Toronto Police Service, and other security agencies, to ensure the safety of all fans attending games at Air Canada Centre, including playoff tailgate events at Maple Leaf Square. In addition to the safety measures already in place, Toronto Police Service will be implementing a number of additional measures including road closures surrounding Air Canada Centre tonight to create the safest environment for our fans watching in Maple Leaf Square, as well as providing enhanced security inside Air Canada Centre. For more information about road closures, please visit the Toronto Police Service web site. Earlier today, Toronto Mayor John Tory and Toronto Police Deputy Peter Yuen made a statement following the attack. Deputy Yuen advised the media that the incident happened at the busy intersection of Yonge Street and Finch Avenue Monday afternoon around 1:30 pm. Police confirmed they located the vehicle, the driver is in custody and he is currently being investigated.